insufflation system typical of bagpipes) was fashionable at court, that was well suited to embody the topoi of a bucolic and pastoral imaginary so loved by gentlemen of the time. Even the lower class come into contact with the typical elements of the ruling class, so the musical material of hegemonic culture is received into different social levels which, passively, admit some aspects and sometimes reinvent characters, forms and contents. It is necessary to quote Charles Burney (1726 – 1814) who, during his musical journey in Italy, during his stay in Naples wrote: “This evening in the streets there were two people singing alternately; one of these Neapolitan Canzoni was accompanied by a violin and calascione. The singing is noisy and vulgar, but the accompaniments are admirable, and well performed. The violin and calascione parts were incessantly at work during the song, as well as the ritornellos. The modulation surprised me very much: from the key of A natural, to that of C and F, was not difficult or new; but from that of A, with a sharp third, to E flat, was astonishing; and the more so, as the return to the original key was always so insensibly managed, as neither to shock the ear, nor to be easily discovered by what road or relations it was brought about.” (The Present State of Music in France and Italy, 1773). In modern traditional Irish music, typical instruments are often an evolution of those already used in the classical tradition (as in the case of fiddle and conical flute) and the uillean pipe preserves a bellows analogous to the musettes of the French courts. In the same way the “battente” guitar, probably of cultured and seventeenth-century origin, survives, sometimes with substantial differences, in the traditional contexts of southern Italy. Same happens with music, in dynamic and continuous osmosis. The topic of the Cd rotates around a question: was there, a few centuries before us, a fruition of musical material outside its context of reference? The answer we give is: surely. What characteristics we could not say with certainty, but this lack translates into a great form of freedom, allowing new musical solutions and experimenting. Imagine a piece by Falconieri played by musicians of oral tradition, perhaps not educated in the practice of basso continuo and reinterpreting the music of the court, far from the rules of nobles and gentlemen and re-proposed with the energy, the vitality, the freedom that distinguishes so many popular music of today and, perhaps, at the time. Alessandro de Carolis Flautist and multi-instrumentalist, he studied recorder with Maria de Martini, completing the studies with Han Tol, Goffredo Degli Esposti, Federico Maria Sardelli and especially Dan Laurin in several master classes in Italy and abroad. Versatile musician interested in different musical languages, he collaborates for concerts and recordings with Stefano Bollani, Daniele Sepe, Gianni Lamagna, Ring Around Quartet, OPC, Eugenio Bennato and Giovanni Mauriello and other artists, playing regularly in concerts and festivals in Italy and abroad, with a repertoire ranging from Medieval, Renaissance and Baroque to experimentation and world music. He plays in the ensemble of Peppe Barra, accompanying the Neapolitan actor in theatrical performances (Christmas, Dream of an enchanted night, with Teresa Del Vecchio and Patrizio Trampetti) and touring concerts. Carmine Scialla After studying classical guitar with Enzo Cioffi and contemporary music with Ciro Manna, he devoted himself to the study of the Italian “battente” guitar and the mandolin. He is the founder of the Calatia, the world music group winner of the "Suonare al Folkest" competition and the finalist of the "Andrea Parodi" Contest in Cagliari. He has participated in various festivals in Italy and abroad: Kaulonia Tarantella Festival (Reggio Calabria), Carpino Folk Festival (Carpino), Tarantella Power (Catanzaro), Notte della Tammorra (Naples), Leuciana Festival (Caserta), Europe Day (Yerevan, Armenia). He has collaborated with numerous musicians from the world music scene, including OPC, Eugenio Bennato, Marcello Colasurdo, Giovanni Mauriello, Luca Rossi, Blue Stuff, and Ar Meitheal. Antonino Anastasia He studied drums with Francesco Paolo Manna and the Zarb with Mohssen Kassirosafar. Founder of the South Italian folk music group "Ars Nova Napoli", he played in numerous festivals of popular and ethnic music in Italy and Europe: F.i.m.u. Festival (Belfort), Desfoca't (Calaf), Neuchatel Buskers Festival. He collaborates with the Ensemble Evì Evàn, a group of Greek rebetic music, with whom he has performed at the Auditorium "Parco Della Musica" in Rome and the Ethos Concert Festival with guest Moni Ovadia. He also plays with the Mescla, a group that works with the Eastern European music. With them, he performed concerts in Italy and collaborated with many Neapolitan artists. Andrea Falconiero: (b Naples, 1585/6; d Naples, 19 or 29 July 1656). Italian composer and lutenist. He may have had lessons with Santino Garsi at Parma, where, according to Pico, he was brought up from an early age by the duke. He was employed as a lutenist at Parma from 1604 and replaced Garsi as official court lutenist by December 1610. After banking his salary for November 1614, he absconded, possibly to Mantua: in a letter of 12 December 1615 from Florence, where he appears to have been a temporary musician at court, he told the Duke of Mantua that he was sending him some of his compositions and recommended that they be sung by ‘Signora Margherita and her sister’, which suggests that he was already familiar with the musical resources there; he also said he was preparing to publish some of his pieces. His first known publication, a book of villanellas, appeared in 1616, and by 1619 he had also published six books of monodies and one of motets. The dedication of the villanellas to Cardinal de’ Medici suggests that he had indeed been employed at Florence, and this may have led to an appointment in Rome. About 1620–21 he appears to have married and moved to Modena as a player of the chitarrone and chitarriglia alla spagnola. Shortly before 24 July 1621 he departed for Spain, leaving behind his wife, one song and some copies of his (lost) book on the Spanish guitar, ‘a work already dedicated in print to the King of Hungary (now emperor)’. He was later ordered to proceed to France and seems to have travelled there and in Spain for some years. In October 1628, however, he took part with Loreto Vittori in the festivities at Florence for the wedding of Princess Margherita de’ Medici and Odoardo Farnese, Duke of Parma, and on 20 April 1629 he returned to Parma as a chitarrone player. Pico said he moved to Modena and Genoa after the death of Duke Ranuccio in 1635, but he was a music teacher at the convent of S Brigida, Genoa, from 1632 until at least 1637; in June 1636 he was denounced by the mother superior for distracting the nuns with his music. He was appointed lutenist in the royal chapel at Naples in 1639. In 1642 he obtained leave to visit his wife in Modena and appears also to have visited Genoa. Following the death of Trabaci in 1647, he was appointed maestro di cappella at Naples and held the post until his death of the plague. Falconieri appears to have been most prolific as a songwriter but only three of his six or more books of secular vocal music are known to survive. These display a gift for melody and an interest in various musical forms. They are, for instance, among the earliest to reveal a distinction in the same song between recitative or arioso and aria; the best example of this is Deh dolc’anima mia (1619, ed. in Adler and Clercx), but a similar tendency can be found in Spiega la vela nocchiero (1616). His book of villanellas (1616) also includes an aria for soprano and bass, ‘sopra la ciacona’, a favoured duet combination for Falconieri. His instrumental music survives in two large collections, one printed, the other manuscript. In the former there is little apparent difference between the works labelled ‘canzona’, ‘sinfonia’, ‘fantasia’ or ‘capriccio’: they all comprise two to four sections, all repeated, of which the last is often in triple time; some have descriptive titles, for example ‘L’eroica’, ‘La ennamorada’ and ‘La murroya’. There is also a ‘passacalle’ (32 variations on the descending minor tetrachord) and a ‘folia’ setting (16 variations on the well-known eight-bar bass). The pieces are in a fresh, spirited style with much imitation between melody and bass lines. The manuscript collection was probably copied in Florence or Rome between 1620 and 1640 for Gioseppe Antonio Doni. 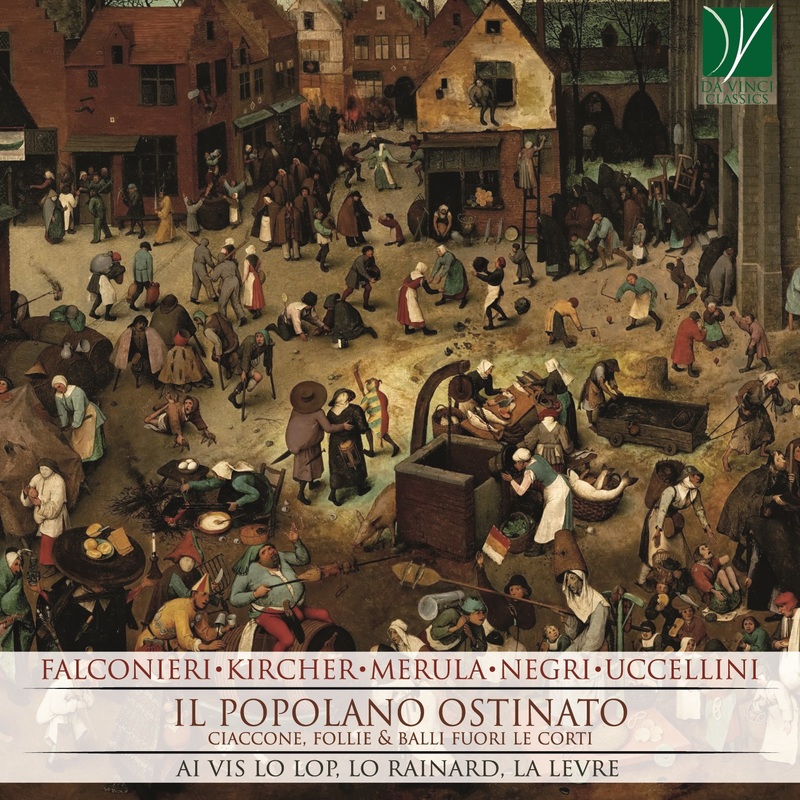 The attribution to Falconieri is most likely reliable, given his reputation as a lutenist and chitarrone player. Athanasius Kircher (b Geisa, nr Fulda, 2 May 1601; d Rome, 27 Nov 1680). German polyhistorian, theologian and music theorist, active mainly in Italy. He is important for music as the author of Musurgia universalis, one of the most influential of all music treatises and specially notable among those of the Baroque period. Kircher related the few known facts of his early life in an autobiography (see Seng’s translation of Langenmantel). His father, who received a doctor’s degree in philosophy and theology from Mainz University, was apparently also a musician, for Kircher credited him with his first instruction in music. After starting his education in his home town, he entered a Jesuit school at Fulda in 1612. On 2 October 1618 he became a novice at the Jesuit college at Paderborn, thus initiating a long period of intensive training in various Jesuit schools in both humanistic and scientific subjects. In 1622 he was forced to leave Paderborn because of the ravages of the Thirty Years War and went to Cologne to continue his studies in the physical sciences and philosophy. The following year he underwent further language training at Koblenz but was soon required to move to Heiligenstadt, near Göttingen, to teach Greek. Probably in the same year he was sent to the residence of the Archbishop of Mainz, Johann Schweikard von Kronberg at Aschaffenburg. In 1624 he began four years of theological study at Mainz, where in 1628 he was ordained. A final year of teacher training, which he pursued at Speyer, was required of him before he received his first appointment in 1629 as professor of mathematics, philosophy and oriental languages at the University of Würzburg. Two years later, when the Swedish army threatened Würzburg, he fled to France: he was sent first to Lyons and shortly afterwards to Avignon, where at a Jesuit college he took up a position similar to the one he had held at Würzburg. At Avignon he began an intensive study of the natural sciences and at this time became acquainted with Senator Nicolas Peiresc of Provence, whose similar enthusiasm for the sciences and especially for the study of ancient eastern civilizations led to a lasting friendship that soon influenced Kircher’s career. In 1633 Kircher received an appointment as court mathematician to the Emperor Ferdinand II at Vienna. He decided to travel by way of Rome, which he reached on 14 November. However, through the influence of Peiresc, who urged both Cardinal Francesco Barberini and Pope Urban VIII to keep him in Rome, he found on his arrival that he had been appointed to the Collegio Romano as professor of mathematics, physics and eastern studies. He remained there for the rest of his life except for brief visits to other parts of Italy and a longer journey, in 1637–8, to Malta as the father confessor to Landgrave Friedrich of Hessea-Darmstadt. Eventually he was released from teaching so as to be able to devote himself entirely to research and writing. In his later years he often went for reasons of health to the chapel of S Maria della Mentorella at Guadagnolo, a village near Palestrina, and after his death his heart was interred there. Cesare Negri (b Milan, c1535; d ?Milan, after 1604). Italian dancing-master. His important treatise on dance, Le gratie d’amore (1602), is dedicated to Philip III of Spain, then ruler of Milan, but most of it was written during the long reign of Philip II, who died in 1598. This treatise gives the most comprehensive picture in a single source of social and theatrical dance and dance music of the late Renaissance; it reveals the great geographic spread of Italian dancing-masters, dances and techniques to many courts of Europe and testifies to the existence of a fully professional class of virtuoso male dancers. Taken together with Fabritio Caroso's works, Il ballarino (1581) and Nebiltà di dame (1600), it provides a colourful context for the social dances of the Italian upper classes. Negri's treatise is in three sections (trattati). The first section provides information about the author's professional life; Negri is unique in supplying enough autobiographical detail to give readers some idea of the life of a successful dancing-master of the period. His annotated list of Italian dancing-masters includes his teachers, colleagues and disciples along with their specialities and locales. The lists of his titled students during his 40-year career in Milan are organized under the successive governorships of Milan, making it reasonable to date the dances he dedicated to some of these pupils later in the book. His citations (with dates) of important events in Italy and Spain in which he participated as performer or director between 1555 and 1600 make his work a summation of styles and techniques of northern Italy during the second half of the 16th century. He is, furthermore, the only authority to include detailed descriptions of various allegorical processions which involved dancers and musicians, together with the precise instrumentation employed, as well as the identification of the characters portrayed. The treatise's second section includes some advice on ballroom etiquette, but is primarily devoted to the steps and combinations of many complex and highly competitive galliard variations for men (see Dance, fig.8); these include such feats as multiple capers (capriole intrecciate or entrechats), and double turns (salti tondi or tours-en-l’air). It is apparent that the principle of improvised variation in music was applied to dance as well, although the exact relationship between improvised dances and their improvised musical variations is difficult to determine from Negri’s treatise since, unlike Arbeau’s, it does not use dance notation which precisely correlates steps and music. Nevertheless, Negri did give the precise number of leg gestures within a fixed span of time (for example, ‘this variation is done quickly, and has 25 strokes in four musical measures’), thus making it possible to establish norms of tempo. However, the final choice of tempo for a given variation depends as much on its physical requirements as on the size, skill and elevation of the dancer. In the third section of the treatise Negri gave a set of rules for steps, which appears to be largely taken from Caroso’s Il ballarino; but most of the section is devoted to directions for 43 dance choreographies, by himself and others, with their music printed in lute tablature and mensural notation. Many of the dances are both more difficult and more interesting than those supplied by Arbeau and Caroso. A considerable number are figure dances for two couples, a type not found elsewhere, and there are also figure dances for four couples which employ figures similar to those in English country dances and American square-dances and reels. Some of the dances, such as La Corrente and Alemana, are the only Italian version of their types to appear in a 16th-century source. The musical significance of Negri’s dance collection is considerable, even though much of it is composed by means of a pasticcio technique in which pre-existing melodic or rhythmic cells are united and reunited to fit the music to the dance. The music is simple, homophonic and repetitive. Popular bassi ostinati of the period appear, for example the canary and passacaglia (La Catena d'Amore). One-movement dances have from one to three strains, each made up of two- or four-bar phrases. Most of the ballettos, which dominate the collection, are in several movements which may be musically related, with different mensurations and varying instructions as to the repetition of sections. They give valuable information about the variation suite and its performing practice. Most begin with an unnamed movement in duple metre, similar to a figured pavan, followed by a galliard (so-named in source); the piece may close with a return of the first movement or sometimes with a canary in rapid triple metre. Some dances are set to popular and pre-existing vocal pieces by such composers as Orazio Vecchi or Gastoldi (e.g. Vecchi's So ben mi ch'a buon tempo), showing how such music could be choreographed, adapted or supplemented to suit the choreographers' purposes. Negri's specific rubrics for the musical paths to be followed by the musicians reveal a complexity in combining musical strains with choreography which is not evident when looking at the music alone. Those dances specifically designed for the stage typify what contemporary composers such as Monteverdi would have expected for their staged balli. The Brando detto Alta regina, for four shepherds and four shepherdesses (see illustration), is an elaborate finale to a set of intermedi of 1599 that included the Orpheus myth. Marco Uccellini (b c1603; d Forlimpopoli, nr Forlì, 11 Sept 1680). Italian composer and instrumentalist. After studying in Assisi he settled in Modena some time before 1639. In 1641 he became head of instrumental music at the Este court and in 1647 maestro di cappella at the cathedral there, a post he held until 1665. From 1665 until his death he was maestro di cappella at the Farnese court at Parma. None of the music of the operas and ballets he produced there has survived. Uccellini is important as a composer of instrumental music, of which his extant output comprises seven printed collections; at least one other (op.1) is lost. Opp.2–5 are mainly devoted to sonatas, while the later prints contain shorter sinfonias and dances. Although the sonatas are early, they, together with his development of violin technique, represent his most notable achievements. Most of the sonatas are basically in ternary form; others are in as many as five sections. Variation and sequential repetition of themes and phrases are favourite methods of expanding sections; in an attempt to achieve thematic unity more than one subsequent section of several sonatas opens with a variant of the initial idea or even of an entire previous section. Uccellini’s use of triadic themes and lengthy sequences modulating through the circle of 5ths points towards a strong connection with the style later to be developed in Bologna by Cazzati, G.B. Vitali and G.M. Bononcini. His exploration of more distant keys such as B major, B minor and E minor, unusual in string music of the time, is notable. He also used piquant chromaticisms and false relations. The range of the violin is extended up to 6th position (g'''), and slurs, tremolo passages and wide leaps are frequent. The solo violin sonatas of opp.4 and 5 represent the highest point of development in the genre before J.H. Schmelzer and Biber. They are longer and in a patently more virtuoso style than those of Biagio Marini, and are clear counterparts to keyboard toccatas. The sinfonias, except for a battle piece in op.8, are less adventurous than the sonatas. The arie of the 1642 and 1645 collections are descendants of the older variation sonata; their thematic material includes an interesting selection of popular tunes of the time. Tarquinio Merula (b Cremona, 1594–5; d Cremona, 10 Dec 1665). Italian composer, organist and violinist. He was one of the finest and most progressive Italian composers of his generation, and excelled in both vocal and instrumental music. The suggested years for Merula's birth derive from the fact that he was confirmed on 23 April 1607, probably at the customary age of 12. His earliest post was probably as organist of S Bartolomeo, the church of the Carmelite Fathers, at Cremona. On 22 October 1616 he signed a three-year contract to serve as organist of the church of the Incoronata, Lodi. He was re-engaged on 8 February 1620 but appears to have left Lodi at the end of January 1621. He probably went directly to his next known position, in Poland, since in a letter of Anton Neunhaber of about that time he is mentioned as being in Warsaw. In 1624 the nature of his position is made explicit: he was serving as ‘organista di chiesa e di camera’ to Sigismund III, King of Poland. Returning to Cremona, Merula was elected on 18 February 1626 provisional maestro di cappella for the Laudi della Madonna, which took place at the main altar in the cathedral on Saturdays and on vigils of Marian feasts. A regular appointment followed on 13 January 1627. In 1628 he was also holding the position of organist of the collegiate church of S Agata. His next move was to Bergamo, where on 12 April 1631 he signed a three-year contract to serve as maestro di cappella of S Maria Maggiore. As successor to Alessandro Grandi (i), who had died in the plague of 1630, Merula began the work of rebuilding the cappella. In his first year G.B. Buonamente was one of its members. Merula was, however, dismissed on 29 December 1632 for ‘indecency manifested towards several of his pupils’. Threatening a lawsuit to recover his lost salary, he was in turn faced with the prospect of a criminal complaint lodged by the governing body of S Maria Maggiore. On 11 April 1633 the matter was resolved by a statement from him in which he apologized and relinquished all claim to his salary. He again returned to Cremona and at his own request and by prior agreement was reinstated on 19 August 1633 as maestro di cappella for the Laudi della Madonna in the cathedral, thereby displacing G.B. Minzio, maestro at the time. Disagreements with the governing body there over matters of salary and responsibilities, however, led to his resignation in 1635. He is next heard of in 1638 at Bergamo, this time as maestro di cappella and organist at the cathedral, adjacent to S Maria Maggiore. Further problems with his former employers at S Maria Maggiore prompted them on 14 April 1642 to forbid any of their musicians to perform under his direction, thus disrupting the customary exchange of musicians between the two churches. He appears to have remained at Bergamo Cathedral until his final return to Cremona, which resulted from his appointment on 25 August 1646, in succession to Nicolò Corradini, as organist of the cathedral and as organist and maestro di cappella for the Laudi della Madonna. He thus held the last of these posts for the third time, and he now held all three until his death. In 1643 he collaborated with five others in composing music for La finta savia, performed in Venice. He was a member of the Accademia dei Filomusi of Bologna and a Knight of the Golden Spur.